With a major objective of winning gold at the Pacific Games in Apia, Samoa this year, the PNG Football Association (PNGFA) has unveiled its preparation plan for both men and women, including two international friendlies for men’s team schedule for early June. PNGFA Technical Manager Paul Isorua said the proposed preparation schedule for both team would be tight and crucial as PNG prepares for the Pacific Games. He said with Bob Morris appointed as the men’s coach and Frederica Sakette as the women’s coach, both are at the helm to get their sides preparations underway with first training camp 15-24 April for the men and 29 April-02 May for the women. Bob Morris will be assisted by Harrison Kamake while Margaret Aka will be assisting Frederica Sakette. All coaches are OFC accredited coaches. The first training camp for the men’s will be split into two groups with the Port Moresby based players training in Port Moresby from 15-17 April while Lae, Madang and Highlands based players will have theirs on 22-24 April in Lae at PNGFA Academy. Players identified and selected for the training squad play their football in the Kumul Petroleum National Soccer League and local MA competitions with a few overseas-based players also on the radar. Isorua says there is a group of players which the coaching staff are working with as a core to the team, with wider player identification ongoing. 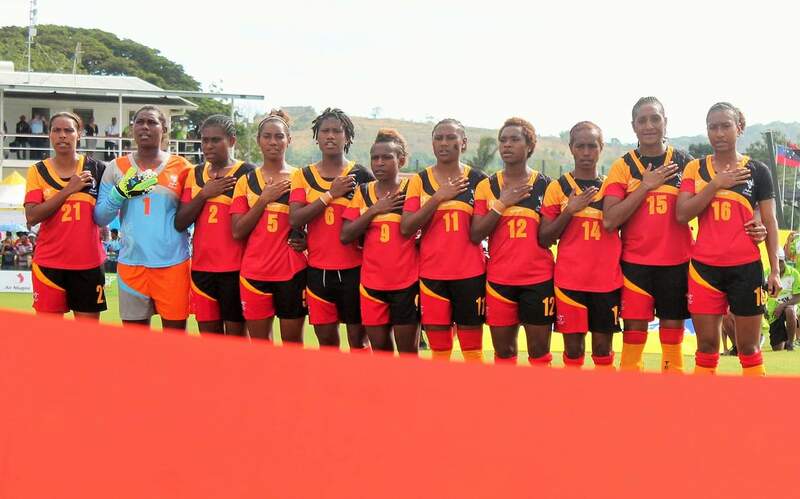 After the split camp, the final 30 players selected will have a second training camp in Lae from 20-23 May while the women will have their final training camp in Port Moresby from 15-30 June before the announcement of final 23 players for departure. “We set our goals very high and we want to win gold. Anything less than a medal will be disappointing for us,” Isorua says. The final 23 men squad is expected to be finalised in Port Moresby at the conclusion of the final training camp from 15-30 June. All players are to contact both Team Managers for the first High Performance screening in Port Moresby. The next screening will be organized in Lae thereafter for players located outside of Port Moresby. Men’s team manager - Gordon Manub, Ph: 70041555 and Women’s team manager - Roosje Suwae, Ph: 72104834 / 76879540. Men’s train-on squad: Abel Redenut, Alex Kamen, Alwin Komolong, Atti Kepo, Ricky Wadunah, Basil Jofari, Clement Willis, Daniel Joe, David Browne, David Muta, Dinniget Luaine, Donovan Murray, Edwin Darius, Emmanuel Simon, Emmanuel Simongi, Emmanuel Airem, Felix Komolong, Freeman Giwi, Gregory Togubai, Henry Ronny, Ilai Ilarova, Ishmael Pole, Jacob Sabua, Jonathan Allen, Jordan Kaven, Jordan Tobem, Joshua Talau, Joshua Oscar, Karesa Morris, Kenneth Arah, Kolu Kepo, Koriak Upaiga, Langarap Samol, Leslie Kalai, Michael Foster, Nigel Dabinyaba, Obert Bika, Papalau Awele, Patrick Aisa, Philip Steven, Raymond Gunemba, Ronald Warisan, Russell Nirik, Stahl Gubag, Tommy Semmy, Wira Wama, Yagi Yasasa, Shane Sakael, Otto Kusunan. Women’s train-on squad: Margaret Joseph, Olivia Upaupa, Lucy Maino, Yvonne Gabong, Kesai Kotome, Selina Unamba, Carolyn Obi, Marie Kaipu, Ramona Padio, Georgina Bakani, Gloria Laeli, Betty Sam, Faith Kasiray, Gloria Balamus, Sandra Birum, Rayleen Bauelua, Meagan Gunemba, Judith Gunemba, Fidelma Watpore, Dorcas Sesevo, Deslyn Siniu, Serah Tamgol, Daisy Winas, Jacobeth Bani, Joelyn Aimi, Jacklyne Maiyosi, Isabella Natera, Belinda Giada, Marity Sep, Michaella Kurabi, Mary Wari, Lydia Kose, Alison Paulias, Nicole Walter, Fidorah Namuesh, Norma Kasiray, Susan Manas, Nicole Bekio, Abigail Wagol, Shalom Waida, Jerolyn Gala, Asaiso Gossie, Ruth Giada, Agai Max, Serah Anthony, Pauline Nuasi, Gethrude Waninara, Delma Ambrias, Sylvia David, Mercia Tumin, Tabitha Wana.